Free-to-use mobile video chatting service is one of the most hottest technology trends to reflect an ever-growing smartphone and tablet market shares. While Qik has just added cross-platform video calling capability to its mobile app, the another well-known mobile video chatting provider, Fring is also bringing an interesting, long-awaited revolution to its mobile video calling service, dubbed as fring Group Video. Which the company claims as the world’s first free mobile group video calling service for iPhone and Android-powered mobile devices, enabling 4 fringsters to see each other at the same time through a single video call. This 4-way video call offers fring users worldwide more freedom to easily get together with their friends anytime and anywhere. The amazing 4-way video calling which utilizes fring’s proprietary DVQ (Dynamic Video Quality) technology to ensure superior video and audio quality is completely free of charge, you just need to connect your device’s fring account to Internet over 3G, 4G or Wi-Fi connections for quick video calling to 3 fring friends simultaneously. With fring’s group video calling, that is no point for you to rush home to computer for starting a multi-way video calling with your friends and family – all of these can be done whenever and wherever right on your compatible iPhone, iPad, iPod or Android-based device. 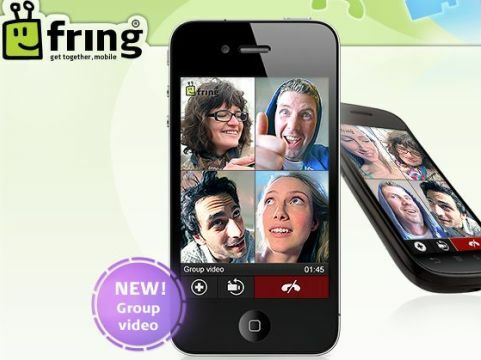 The new fring Group Video Calls mobile application is now available as a free download through Android Market and the App Store.